Total sales of the greenhouse, nursery, field cut flowers and sod industries increased 2.2% to $3.8 billion in 2017. Greenhouse products accounted for 78.0% of total sales ($2.9 billion), up 3.0% compared with 2016. This was the result of a 7.1% increase in greenhouse fruit and vegetable sales to $1.4 billion. Sales of nursery products fell 1.7% to $659.3 million, and accounted for 17.6% of total sales. Tomatoes, peppers and cucumbers accounted for 95.5% of greenhouse fruit and vegetable sales in 2017. 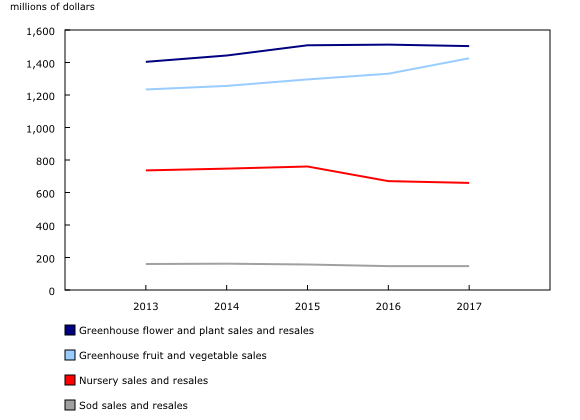 Sales of greenhouse tomatoes accounted for almost 40% or $556.6 million of total greenhouse fruit and vegetables sales in 2017, up 3.6% compared with 2016. Pepper sales totalled $421.9 million, up 2.9% from 2016. Greenhouse cucumber production has been expanding outside of Ontario and British Columbia, with new producers in Alberta and Quebec in recent years. Cucumber sales rose 14.1% to $383.5 million due to this additional production. Although lettuce accounted for only 2.2% of total greenhouse fruit and vegetable sales in 2017, its sales grew 17.2% to $32.1 million, as production increased. Indoor and outdoor potted plants accounted for 60.5% of the flower and plant sales for Canadian greenhouses in 2017, with sales totalling $786.9 million. Potted plants sales fell 3.0% for the year. The most common varieties reported were geraniums (15.1 million pots), herbs (11.6 million pots) and miniature rose pots (10.4 million pots). Sales of prefinished products rose 7.6% to $386.5 million in 2017. Sales of ornamental bedding plants increased 6.2% to $204.2 million, while vegetable bedding plant sales increased 12.0%, in response to vegetable producers' higher demands for transplants. Greenhouse total operating expenses rose 4.1% to $2.6 billion in 2017. Labour still accounted for the largest share of total expenses (28.8%). The number of employees increased 1.5% to 33,089 employees, while payroll rose 3.1% to $735.3 million. The largest increase was reported for the other crop expenses category (+21.0%), which includes expenses for growing mediums, fertilizer, pesticides, pollination, irrigation, bioprograms, containers and packaging. There were also increases in purchases of plant material for growing on (+7.8%) and fuel expenses (+6.7%). Other operating expenses, such as repairs to farm buildings, machinery, equipment and vehicles, land taxes, interest, insurance, and contract work, represented 22.1% of total expenses. Total greenhouse area increased by 2.0% or 491 975 square metres in 2017 compared with 2016. 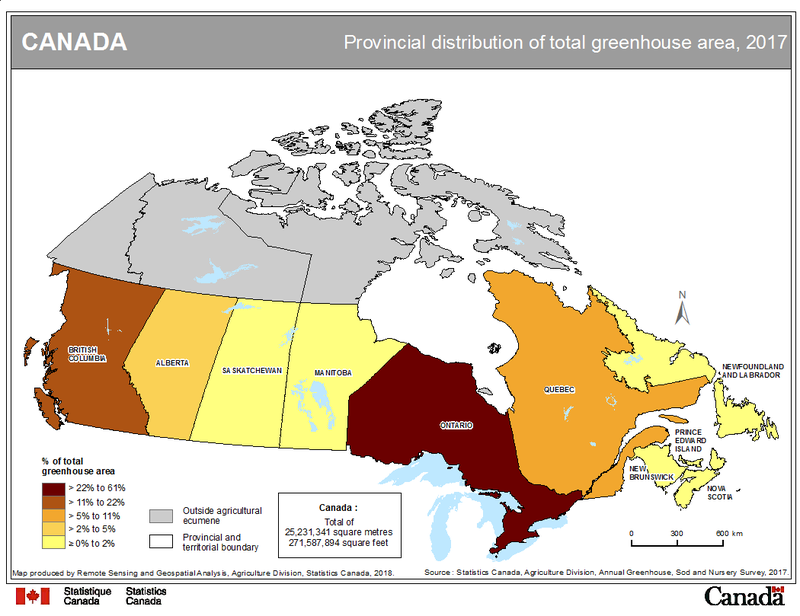 As shown in Map 1, total greenhouse area is concentrated in Ontario. In 2017, Ontario represented 60.3% of total greenhouse area in Canada, compared with 21.3% in British Columbia, 10.3% in Quebec and 4.5% in Alberta. Total nursery area decreased 3.7% in 2017 to 17 691 hectares. This decline was accompanied by a 0.5% decrease in nursery product sales to $527.9 million, and a 6.0% decrease in resales to $131.4 million. 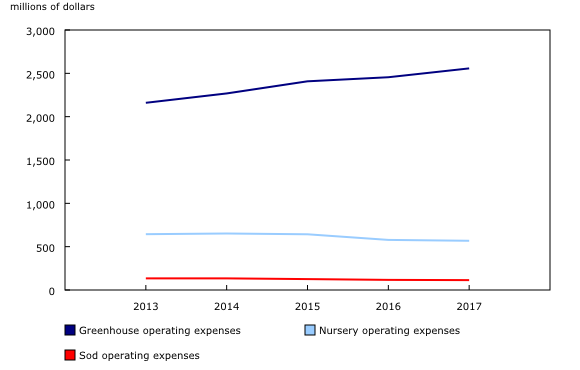 Nursery operating expenses fell by 1.7% to $568.3 million. Labour expenses accounted for 35.1% of total expenses, down 1.2% compared with 2016 due to the change in the total number of employees, which fell 7.5% to 10,600 employees. In 2017, total sod area decreased 6.4% to 20 522 hectares. Total sales were stable at $147.3 million, while expenses decreased 3.2% to $113.7 million. Labour expenses accounted for 34.3% of total costs and this proportion was stable (34.8%) compared with 2016.